The Camino Lebaniego route starts in Santander. The first 3 days of this route you follow the Camino del Norte and after that you enter the mountains of the Picos de Europa National Park. of the Picos de Europa National Park. Camino Lebaniego is a “hidden” Camino that starts at the Bay of Biscay and goes through lush hinterland and into the National Park of Picos de Europa. You will experience sea, countryside and mountains, all during the same hike. You will overnight at charming and traditional hotels, each with its unique and cozy atmosphere. From the coast you can see the peaks with snow from the mountains on the southern horizon. The majority of the walk is along the Camino Lebaniego, one of the world's most important pilgrimages and a Unesco World Heritage Site. The stretch on the Camino del Norte between Santander to Gijón is a clear example of the best of Northern Spain: lovely beaches, quaint fishing towns, impressive natural landscapes and culture. The cuisine is some of the best and judging from a scenery point of view, it would be difficult to find anything more beautiful. The terrain along the Camino del Norte is quite varied without being difficult to hike. The majority of the days it's possible to divide the stages, if you like. In summary, this route has everything one could desire in a vacation in the North of Spain. In the "stages" section you will find more detailed information as well as maps of the stages and photos. Service functions are very good throughout the length of the route. The end of the Pilgrimage is the Romanesque Monastery of Toribio, which is one of the five most important Christian pilgrimage sites in the world, along with the Cathedral of Santiago de Compostela in importance, but on a smaller scale. The Monastery preserves a one of a kind relic (Lignum Crucis), the world's largest piece of the Holy Cross of Jesus, brought to Spain from Jerusalem by Constantino, who is also buried in the Monastery. During the first stage, the trail follows the Nansa River, which is the river with the most salmon in all of Cantabria. The trail winds through green valleys, over small hills and into small villages with a peaceful atmosphere all around you. Everyone you meet is welcoming and proud over the fact that you are visiting their little town. You’ll get a unique glimpse into the rural and authentic Spain, which a lot of tourists don't ever get the chance to see and visit. are not used to seeing pilgrims. Get to know the most rural and unknown Spain. The surroundings during the first 2 days on the Camino Lebaniego are best described as something taken from a fairytale. You pass by cows grazing freely in flowering meadows, waterfalls, small lakes and walk over pebbly streams crossing over them on small wooden bridges. Next to the trail there is an abundance of apple and pear trees, where you might want to stop to pick a quick snack. The further south you walk, the more the landscape starts changing and the mountains get closer. The scenery becomes dramatic and the terrain gets steeper. Small crystal-clear rivers flow down below you in deep gorges, and nature provides you with a micro-climate of varied fauna and rich wildlife. Moreover, there are plenty of vista points where you can stop and enjoy the spectacular views. You will also pass many small picturesque churches, strategically built in the middle of nature and surrounded by mountainous cliffs. When most of the Iberian Peninsula was under occupation by the Moors, these inaccessible areas offered places of refuge for early Christians. Eventually, the Reconquest of Spain began in the mountains and caves of this region. Along the way, you will see many viewpoints from where you can enjoy the whole landscape. During the Camino, you can eat lunch and dinner in local cider houses, restaurants or bars. You'll have the chance to try delicious Cantabrian cuisine with signature dishes like the Cocido Lebaniego, grilled meat, traditional cheeses, and of course, a number of well-known desserts. Spain is More organizes accommodations and transport, so that you can fully enjoy your vacation. You walk at your own pace, and with our guidebook in hand you will get all those little tips and tricks that only the locals know about. The accommodations are small rural hotels with a marked traditional and family character. The accommodations are well located and always welcome pilgrims / tourists with a smile. Note: It is possible to extend this trip with two more hiking days from Potes. Walk through the fantastic valley of Liébana to the Cable Car in Fuente Dé, where you can spend the night in a luxurious Parador hotel. Please, just let us know if you would like to extend your holiday. You can also add additional activities and more nights in Bilbao, Santander or Potes. See the detailed program below. Our personalized written guide will accompany you all the way. Here you will find all kinds of information about the route as well as the places you will go through. You usually arrive at Bilbao Airport, and from there it is a short bus ride of 50 min to Santander (included in the price). Santander is a vibrant city located in one of Spain's most beautiful bays. Start your holiday in Spain by taking in the city's sights, the atmosphere and end the evening with delicious tapas. A great way to start to your first day in Northern Spain! In the guidebook, you can find our favorite tapas-bars all over the city. It is recommended to take a day or two extra in Santander, especially in the summer, where you can start your vacation on the fantastic beaches. A small train transports you through the relatively boring suburbs and industrial areas of Santander. After about 20 minutes in the train you will see the lush green tones, which will be characteristic for the rest of the journey. You can choose to leave the train in two places, depending on how far you want to walk. The train ticket must be purchased at the station (not included - about 3 € / person), we add a step-by-step plan. You can decide how much time you want to spend in Santander before the walk begins. Depending on where you get off the train, you will walk 7 or 18 km. The practical information will be included in the Spain is More guidebook, which you will receive before departure, this way you will easily get to the beautiful Santillana del Mar. The rivers and infrastructure have have made it a little dificult for pilgrims because you have to make a considerable detour if you do not take the train. are on the Camino del Norte. Santillana del Mar was founded in the 9th century by monks who brought relics of St. Juliana and built a chapel and a small monastery here. The monastery has since been expanded by various donations. Church Santa Juliana is Romanesque style from the 12th century. The city of Santillana del Mar is a monument in itself and it is nice to wander in the small streets with mansions and castles. In addition, it is possible to visit the caves of Altamira, just outside Santillana del Mar. One of the world's most important architectural findings, with its 17,000 ancient cave paintings. A beautiful stage, very close to the sea, along the beautiful coast. The stage moves through green and constantly hilly landscape. A few times you go closer to the beautiful beaches with breathtaking views. Along the way there are several cozy villages, where you experience a very authentic Spain, the daily rural life. Comillas is one of the highlights of the trip. Comillas and Santander were the most prestigious place to celebrate summer holidays in the 19th century and countless wealthy families from Spain have built large summer houses here. The best known is El Capricho, built after the design of the famous Barcelona architect Antoni Gaudi. Three rivers are crossed at the stage of today. Before San Vicente de la Barquera it is advisable to make a small detour through the beautiful nature reserve Oyambre. San Vicente de la Barquera, is a beautiful little fishing village. Then the route enters the country. It is a beautiful and very different area where you are going. In many ways much more authentic - Spain as the Spaniards only know it. Now you're still on the Camino del Norte, you meet 'like-minded' pilgrims and on the way there are several good restaurants for a well-deserved meal. After an overnight stay in a beautiful green area in a small village, continue over the Camino del Norte for another 4 km before the actual Camino Lebaniego starts. 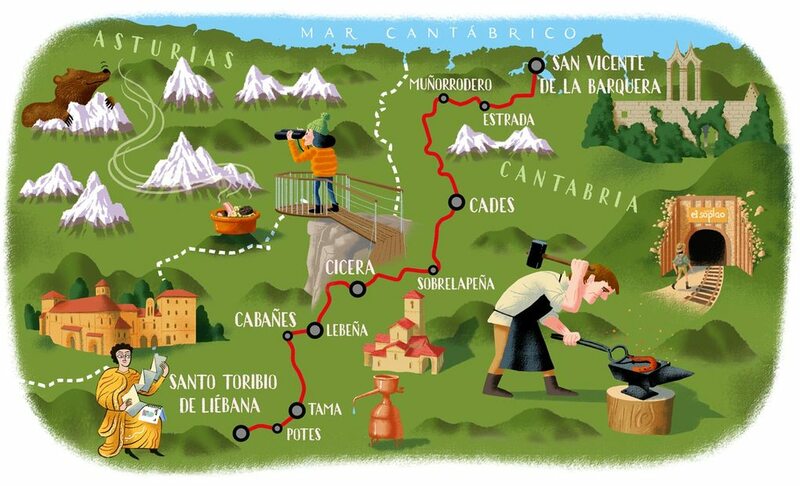 From here the journey is marked with red arrows, which show the way to the Santo Toribio monastery in Potes. You follow the Nansa River to the south. The nature here is beautiful and lush, with small waterfalls in the forests. The walk along the river is also a favorite excursion for many locals because of the beautiful scenery. Accommodation in a charming hotel where you have to try the local cuisine. The Camino Lebaniego now comes closer to the mountains. It is a fantastic stage through mountain villages and untouched nature. The many heights are rewarded with a beautiful view and if you want, you can take a short walk to one of the most beautiful views of Picos de Europa, where you can see the highest peaks of the national park. The village is surrounded by an impressive environment; green fields and forests. A few restaurants and bars are the key points in this town - an experience that will be one of the highlights of the trip. Today's stage is perhaps the most beautiful of all. There are many levels, but the effort is quickly forgotten when you see the beautiful landscape. It is possible to shorten this stage by about 5 km. The small Lebeña church is a mandatory stop on the route. The historic site and the small church were of great importance during the re-conquest of Spain on the Moors. From here Camino Lebaniego continues on the other side of the valley, where you can experience the unspoilt nature of Picos de Europe. Here the local farmers want to keep things as they have always been, and tourism is therefore pushed into second place, which can feel pretty liberating. One of the best cheeses in the area is produced here and if you are lucky, you can also taste it. The last 4 km of the stage goes towards the center of Potes. Potes is the capital of the area with many restaurants, supermarkets, banks, pharmacies, etc. A pleasant mountain village with a lively atmosphere. The monastery of Santo Toribio is another 3 km from Potes, but before you walk the last stretch, you can drop off your backpack at the hotel. In Santo Toribio you visit the monastery and the surroundings. If you walk a few hundred meters further, you will reach a fantastic panaroma point from where you can enjoy a magnificent view over the Liébana Valley and the highest peaks of Picos de Europa. If your camera's memory card was not already full, it will be the case now! The contrast between the often snowy and majestic peaks, the clouds and the blue sky and the green meadows and forests is amazing. You can choose to take a taxi back to Potes, if you are done walking for today. In Potes you can stroll through the cobbled streets and alleyways along the river of the city and enjoy the ambiance and the beautiful architecture of the city. The end of the tour can be celebrated with an exceptionally good dinner. In the guide we recommend some of the best restaurants in the Liébana Valley. During the day, there are many opportunities for active tourism. We can recommend day trip to Fuente Dé where you can take the cable car up to the mountains to enjoy amazing panoramic views. It is possible to walk all the way back to Fuente Dé from there. You can also do an exciting activity called Barrancos. This a fun and different experience for everyone in the family. The beautiful mountains and streams are crossed using various methods and you will try both rappelling, climbing and gliding through streams and rivers; a mixture of various fun mountain activities, which is always a big hit among our guests - youngsters as well as older travellers. Please tell us if you want us to include these, or any other activities in your travel proposal. There is also an option to extend the trip with 2 extra hiking days (you walk 15 km per day). The trip through the scenic valley ends in Fuente De, where you spend the night surrounded by some of Picos de Europa's highest peaks. In the morning, the bus will be taken back to Santander (ticket not included - schedule attached to the guidebook). It's time for relaxation, Santander has some amazing beaches where you can enjoy the day. A dip in the refreshing Atlantic is 'rehab' for both body and soul. The Magdalena Park with its palace and parks filled with flowers is also worth a visit. In the evening, Santander has plenty of good restaurants to offer. It is recommended to spend one day in Santander or Bilbao, depending on your return journey. Departure from Santander or Bilbao. 9 nights in a double room incl. breakfast in charming hotels, carefully selected on quality, location and service. The Spain is More travel guide with directions, recommendations, maps, local tips and more (one book per room). 24/7 emergency number during the trip. * The baggage weight depends on the airline's relationship (usually between 20 and 23 kg). Short transportation, such as a taxi from Bilbao airport to the bus station. Feve train from Santander to the starting point (30 min) *. Bus from Potes to Santander *. * Tickets can not be purchased in advance, but the route map can be found in the travel guide. Transportation to startingpoint from anywhere in the world and back. Please ask us, we will be happy to assist you. Luggage transport: From hotel to hotel on walking trail: 180 euro/piece luggage. From the hotel in Santander to the hotel in Potes 4 days later: 90 €/piece. Each piece may weigh up to 20 kg. The price include 1 Spain-is-More-Travel Guidebook per every room. More copies can be purchased when booking 20€/copy, or 30€/copy if you ask for it with less than 6 weeks prior departure. Cancellation insurance: 6% of total price (can be added when ordering).